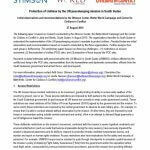 WASHINGTON (Sept. 3, 2015) – The following paper is based on research conducted by the Stimson Center, the Better World Campaign and the Center for Civilians in Conflict in Juba and Bentiu, South Sudan, in August 2015. The organizations travelled to South Sudan to understand the implementation of the UN peacekeeping mission’s mandate to protect civilians. Provided below are initial observations and recommendations based on research conducted by the three organizations. Further analysis from each group is forthcoming. This preliminary paper focuses on three key challenges – (1) restrictions on mission movement, (2) the protection of civilian (POC) sites, and (3) projection of force beyond the POC sites. 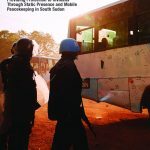 Research included interviews with personnel within the UN Mission in South Sudan (UNMISS); civilians affected by the conflict and living in the POC sites; representatives from the humanitarian and diplomatic communities; officials from the South Sudanese government and armed forces; and local experts. For more information, please contact Aditi Gorur, Stimson Center (agorur@stimson.org); Chandrima Das (cdas@betterworldcampaign.org) or Jordie Hannum (jhannum@betterworldcampaign.org), Better World Campaign; or Matt Wells, Center for Civilians in Conflict (matt@civiliansinconflict.org). The UN mission faces constant restrictions on its movement, greatly limiting its ability to access wide swathes of the country by ground, river or air. These access restrictions are imposed by both parties to the conflict, but particularly by the South Sudanese government (in part because all UN bases are currently in areas under government control). These restrictions are clear violations of the Status of Forces Agreement (SOFA) signed by the government and the mission. To some extent, these restrictions are imposed by the central government to advance its own military aims – for example, to ensure that it is able to conduct attacks without observation by the mission. At other times, they are imposed by local troops or commanders acting outside central command and control, often in an attempt to demand illegal payments or out of belligerence toward the mission. These deliberate restrictions on the mission’s movement, combined with the mission’s severe logistical constraints and environmental factors (such as roads that become impassable during the rainy season), have seriously impaired the mission’s situational awareness and its ability to respond to protection threats, facilitate humanitarian access, and monitor and report on human rights violations. Access restrictions also have implications for the safety and security of personnel. For example, UNMISS troops may be reluctant to push through checkpoints to complete a patrol because of the mission’s policy of obtaining Flight Safety Assurances (FSAs) from the government and/or the opposition before each flight, which, compounded by onerous internal mission procedures, prevent the mission from providing effective casualty and medical evacuation if troops are engaged in weapons fire. An internal mission review found that it can take days to deploy an air asset to a high-risk area. Previous fatal attacks on UN helicopters have made the mission reluctant to deploy air assets without FSAs. It has also made the mission’s ability to use other modes of transport – such as barges – all the more important to access remote areas. But even these have become subject to access constraints. 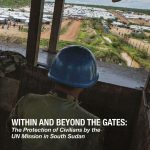 The restriction on the mission’s ability to send a barge from Juba to Malakal in July and August 2015 highlighted the challenges posed by access restrictions and created risks to the provision of critical humanitarian services. The barge was used to deliver food, water and other essential supplies to the UN base in Malakal. Although the mission is not required to seek authorization from the government for barge movements under the SOFA, an UNMISS barge had faced rocket-propelled grenade (RPG) fire in July and the mission wanted to notify the government of its planned movement to reduce the risk of a similar attack. The government informed the mission that it would provide a letter acknowledging the movement, but delayed sending the letter for weeks. In the interim, humanitarian organizations providing essential services to around 35,000 people in the Malakal POC site at the end of July were making plans to dramatically scale back service delivery. Despite the barge restriction consequences for the mission, humanitarian organizations, and internally displaced persons (IDPs), many within the mission felt that it would be too risky to proceed with the barge movement without waiting for the government’s acknowledgement. Government and opposition forces were conducting military operations along the river route. The barges are a limited and critical asset and, as they are slow-moving, there is significant danger to the lives of the personnel on board. Others in the mission felt that waiting for acknowledgement was contributing to a dangerous precedent whereby the mission was essentially seeking the government’s approval to perform critical mission functions, and thought that the mission should proceed without the letter from the government. The international community should recognize access restrictions on the mission and on humanitarian organizations as one of the most serious protection challenges in South Sudan. If these access restrictions continue, the mission will be unable to fulfil its mandate. The mission should continue to coordinate closely with humanitarian organizations and the diplomatic community to engage with the parties to the conflict to lift these restrictions. The mission has developed Standard Operating Procedures (SOPs) for troops that encounter access restrictions during ground movements and has recently begun to record instances in which these SOPs are not followed. This is a positive step to encourage troops to push back against SOFA violations. By sheltering and providing assistance to civilians within six POC sites throughout the country, UNMISS has saved tens of thousands of lives in the middle of a chaotic armed conflict and continues to protect those under threat of physical violence. At the same time, UNMISS’s POC sites present complex and unique challenges for the mission. Personnel within the mission and within DPKO continue to grapple with questions about the short-term requirements and long-term consequences of these sites. Currently, over 200,000 people are being protected at UN bases across the country – a number which may grow further. The mission is responsible for protecting the site perimeters and managing internal safety and security, while humanitarian organizations coordinate closely with the mission to provide services to IDPs within the sites. Yet the sites undeniably create challenges to the mission’s capacity to undertake protection activities in the rest of the country, place a massive strain on resources and assets, cause concerns for the safety and security of mission personnel, and produce unprecedented legal challenges. The mission has made attempts to provide viable alternatives to facilitate voluntary relocations from some POC sites, but none of these initiatives have succeeded, in large part due to government interference. Since April, the number of IDPs has increased dramatically at these sites, particularly in Bentiu and Malakal, as fighting in southern Unity, Upper Nile, and elsewhere has caused a massive influx. The increasing numbers have worsened conditions within the sites and created greater internal and external security challenges. Moreover, internal and external security challenges are compounded by the lack of secure perimeters and lighting at many of the POC sites, including Bentiu and Juba in particular. The porous camp perimeters allow people to avoid official gates when entering and exiting, and to bring in contraband, including weapons and alcohol. Violent armed criminality has recently been on the rise in some POC sites, in part as a result of these challenges. The international community should recognize that there is no short-term alternative to maintaining the POC sites. While the mission and humanitarian partners should continue to look for opportunities to facilitate voluntary relocations and to project force to reduce threats of physical violence that drive new arrivals to the sites, many of the displaced persons living in the sites are unlikely to want to leave the sites in the near future. While it is true that some proportion of IDPs may be staying at POC sites due to food insecurity and may not require physical protection, for many the two factors are inextricably linked. For example, IDPs may have been prevented from accessing their normal sources of food and water because of threats of violence, and have thus been compelled to seek them from POC sites. The mission and humanitarian partners, with support from the international community, should prioritize establishing more secure perimeters for the POC sites, including adequate fencing and lighting. More secure perimeters could improve protection within the sites as well as reduce the burden to the mission of maintaining external security. Because of the limitations imposed by access restrictions and the challenges of maintaining the POC sites, the mission has encountered severe difficulty in projecting force beyond the immediate vicinity of UN bases since the outbreak of the civil war in December 2013. This has had significant implications for the mission’s ability to fulfil its mandate to protect civilians. For example, in response to the atrocities committed by the government in the southern part of Unity state beginning in April this year, the mission was unable to access many locations while the violence was ongoing. Its human rights reporting on the violence was largely limited to reports from displaced persons arriving at its base in Bentiu. In response to the atrocities, the mission developed a plan to project force into southern Unity by conducting longduration patrols and setting up a Temporary Operating Base (TOB). The plan, referred to as “Operation Unity,” currently comprises three phases. During Phase I, the mission performed reconnaissance patrols to survey road conditions. During Phase II, which is currently underway, the mission plans to deploy integrated patrols from the towns of Rumbek and Bentiu into a number of areas in southern Unity. During Phase III, there are plans to establish one or multiple TOBs, including in Leer County. Actors involved in planning and undertaking the mission identified different, though often overlapping, objectives, including: sending a message to combatants that UNMISS is developing a more agile posture; monitoring and recording prior or ongoing human rights violations; deterring ongoing violence against civilians through presence; proactively intervening to protect civilians under threat; and facilitating the delivery of humanitarian aid, partly in an effort to stem the influx of displaced persons into the POC site in Bentiu. It is unclear to what extent the mission can achieve these objectives, some of which are quite ambitious, both in terms of scope and timing. A number of mission personnel expressed doubt that a TOB would be established, particularly within the timeframe proposed. There are also significant risks involved in the operation, notably the risk of raising expectations of civilian populations who may expect a level of protection that the mission cannot realistically provide. However, the operation demonstrates the mission’s will and initiative to take a more proactive approach to the protection of civilians. The mission has also consulted extensively with humanitarians to identify and mitigate risks involved in the operation, and both mission personnel and humanitarians have described the cooperation as highly constructive. Some within the mission regard Operation Unity as a pilot project that might be replicated elsewhere in the country. However, the mission’s ability to project force remains hampered by numerous factors. These include the demands on the military component of maintaining POC site security. The mission’s authorized troop ceiling has also not been increased since December 2013, despite a significant increase in the number of civilians seeking shelter at its bases since April 2015 – nor has the current troop ceiling been met thus far. Finally, the mission lacks critical enablers such as military attack helicopters and airlift assets that would facilitate greater force projection. In particular, a shortage of air assets prevents the mission from providing casualty and medical evacuation if troops are engaged with weapons fire. Operation Unity is a positive step toward fulfilling the mission’s protection mandate. However, given the logistical and access constraints on the mission, the mission’s force projection capabilities are limited. The mission should establish realistic expectations, particularly by engaging the civilian population, for what the operation can achieve. The mission and the humanitarian community have coordinated constructively in the planning of Operation Unity. Regardless of the outcome of the operation, the coordination model could be replicated for other force projection initiatives. Difficulties related to casualty evacuation, including the shortage of air assets, should be analyzed and addressed swiftly by the mission and Member States. The inability to ensure that wounded UNMISS personnel would be quickly evacuated leads some peacekeepers to be risk averse in their projection of force and inhibits longer-range patrols, which undermines the mission’s ability to fulfill its protection of civilians mandate. Download and View Full Report Here.